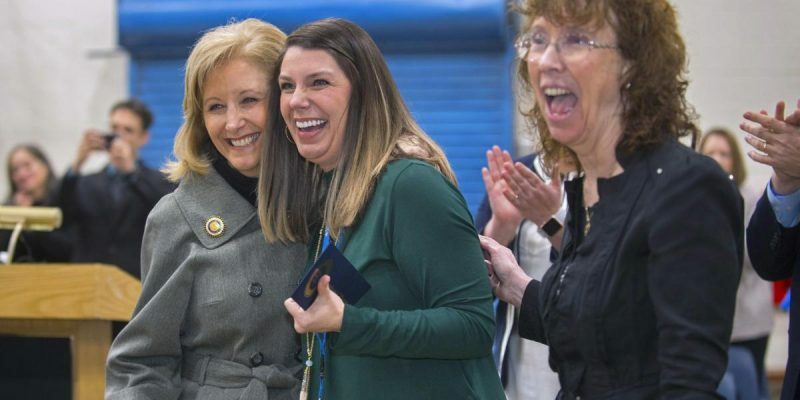 Stephanie Whetstone, who teaches fifth-grade math and science at Bains Elementary School, was one of 33 educators nationwide to receive the Milken Educator Award. Step into Stephanie Whetstone’s fifth-grade classroom at Bains Elementary School in Louisiana’s West Feliciana Parish and you’ll find students spread out on the floor, balancing on stability balls or working at standing desks while Whetstone teaches a small group at her horseshoe-shaped table. An early adopter, Whetstone embraces these habits and reinforces them in her classroom. Her students take responsibility for their learning and behavior, and they understand her expectations. Peer instruction plays a large part in Whetstone’s classroom, and she insists that students learn how to teach and learn from each other. Her methods work: Under Whetstone’s guidance, students’ scores on Louisiana’s LEAP (Louisiana Educational Assessment Program) tests rose from 75.3 to 94.8 in math and from 77.3 to 87.9 in science. Dr. Jane Foley, senior vice president of the Milken Educator Awards, awarded Whetstone personally as West Feliciana Parish’s first Milken Educator and presented her with a $25,000 check. Previous Article How Pro-Life Is John Bel Edwards, Really?